FRIENDS? It’s iconic and you know it. Here’s how you can watch the best gang on television online! The TV series ran for 10 seasons on NBC and ended in 2004. Friends is an American sitcom created by David Crane and Marta Kauffman for NBC. Netflix recently in 2018 acquired the rights to stream Friends, and it has become clear that the TV show still appeals to the audience of 2018/2019 becoming the most binged-watched TV series of 2018. The series stars an ensemble cast and revolves around the lives of three girls and three boys in their 20s and 30s who live in Manhattan, New York City. When you read the names in the Friends cast, starting from Jennifer Aniston, Courtney Cox, Matt LeBlanc, David Schwimmer, Matthew Perry and Lisa Kudrow who become household names over the last 25 years. It is easy to see how the Millenials rediscovered the show because they know all these actors through their other shows and movies. The finale aired on May 6, 2004, and was widely acclaimed by several critics, making it one of the most watched television shows in the early 2000s. Friends aired on Thursdays at 8/7 c on NBC. You can’t stream the show on NBC since the series concluded in 2004, but you can buy the bundled DVDs from the NBC Store. If you’re looking for other ways to watch the series aside from the DVDs, check out our list below! 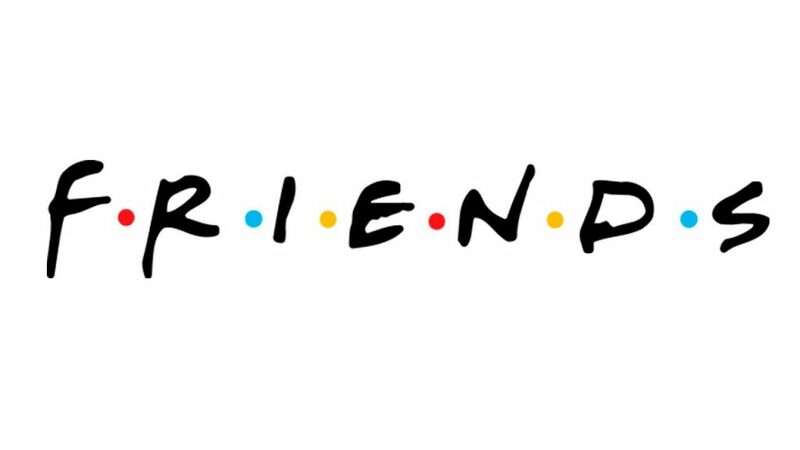 Friends is one of NBC’s most-watched series. You can still relive the laughter by buying the DVDs or Blu-Rays of the series from the NBC Store. It’s a good thing that NBC has still kept seasons of Friends on its store even when it already ended a long ago, and fans of the show still have the chance to buy the series in season bundles or the collection altogether on the website. This one’s perfect if you want to watch it straight on your DVD player at the comfort of your home. NBC Pricing:$19.95 per season bundle except season 1 which is priced at $14.95; $202.92 for Complete Series Collection DVD; $272.95 for Complete Series Collection Blu-Ray. Yes, Friends is also available on Netflix! You heard that right, one of television’s most-watched sitcoms is on Netflix. All 10 seasons of it are up for grabs on this premium streaming platform. Bad news though, as there are rumors that the series is bound to leave Netflix next year. So if you’re currently subscribed to Netflix, now is your chance to binge-watch on all 10 seasons of Friends until the end of 2019. Make it count! If the series is not available in your region, you can use a VPN to unblock it. We’ll show you how. Just scroll down below! Friends on Apple iTunes? Yes, please! For those who are into portability using your Apple devices, try iTunes. All seasons of Friends are also available in the iTunes Store so just choose the one you want to stream! You can also download the episodes individually if you want. Bring the series anywhere and watch it anytime you want. In case you reside outside the U.S., you can still access the library on the iTunes Store through the use of a U.S. iTunes Account. You can save around $30 when you buy the Complete Series Bundle so if you have the money, go for it. Apple iTunes Pricing: $19.99 for season 10; $139.99 for Complete Series Bundle. 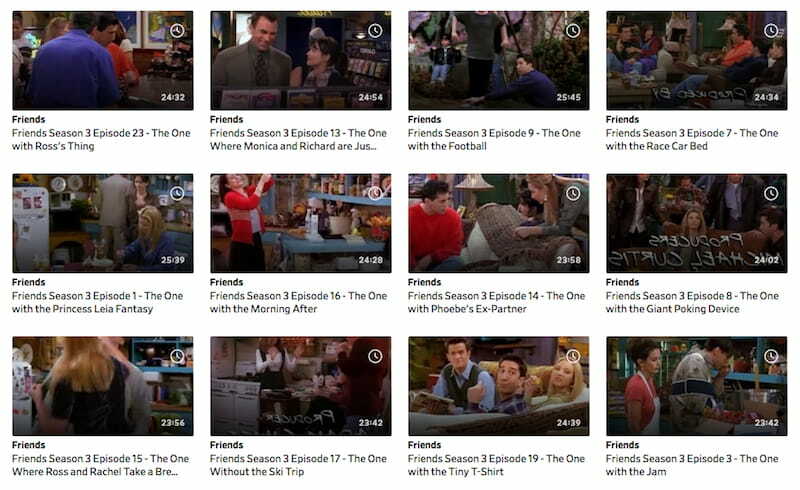 If you have an Android device, try Friends on your very own Google Play Store. Can’t watch on your streaming device but you have an Android phone? Worry no more. Friends is also available in the Google Play Store. All 10 seasons are available for streaming in HD, and there’s also an easy-to-click interface in case you want to go back to a particular episode that you might have missed. All you need to do is just log-in your Google account, go to the Play Store, then click on the episode you want to watch or season bundle you want to buy! If you’re not currently subscribed to anything that’s mentioned above, don’t be sad. We’ll be your friend. 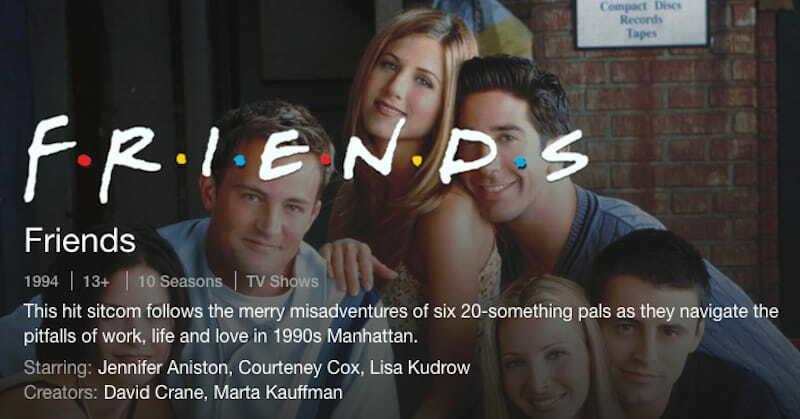 Here are the ways you can watch Friends without spending your (hard-earned) money. Can’t find it on Youtube? Try Dailymotion. Considering Friends’ popularity, YouTube is a lost cause because of its strict copyright infringement policy. There’s no escaping that. And as the popular saying among streamers goes, if you can’t find it on Youtube, then (most) probably it’s on Dailymotion. But unlike official streaming platforms, this one requires a little bit of love since you’re going to search all of the links available on the site to find what you’re looking for. Sneaky uploaders sometimes upload misleading videos to get clicks, so you verify each link before you click. Putlockers is also a good streaming alternative. If you’re into streaming, then you might have encountered Putlocker. The bad thing about this platform is that it changes its website every now and then (possibly because of copyright infringement) so if you’re having trouble finding the site, try typing on google the word Putlocker and start from there. You also need to watch out for pop-ups and ads because this site has a lot. If you’re not patient enough to click through lots of links or pop-ups, then try searching for episodes of Friends the old fashioned way. Simply go to Google, type whatever you’re looking for on the search bar – something like “where to watch friends for free” or “where to watch friends episode 1 free” and browse through the results. The most important thing to take note is that you always need to enable your AdBlocker or subscribe to a premium VPN that can protect your computer when you do this stuff since you’ll be visiting a lot of sites to find what you’re looking for. If you resort to torrenting, you break the law. Piracy and torrenting of copyrighted material are illegal. If you’re keeping a copy of Friends for your sake by downloading it on streaming platforms which allow it, then it’s completely legal (in most countries). It only becomes unlawful when you decide to share your copy to others through a p2p connection. When you share your material, you expose your own network. You’re making yourself vulnerable to privacy intrusion and possible infection of your computer by viruses you don’t know about. That’s why you always need to enable a VPN when you connect – it saves you the hassle from being compromised by covering your tracks and hiding your identity so you remain anonymous and unidentifiable. If you still want to do torrenting, choose a VPN which is good for torrenting or don’t do it at all. It’s your choice. A subtle reminder that Netflix is not available in your region. If you’re seeing the message above, the chances are high that Friends is not available in your region. These kinds of things always happen not only on Netflix but also on other streaming sites, so it gets annoying every time you hop into another platform only to know that it’s still restricted. If you’re tired of this, it’s time you learn how to use a VPN! A VPN is a piece of software that enables you to access content that is restricted in your region. When a VPN is enabled, the streaming platform you’re subscribed to won’t even matter since it re-connects your server to the location of the content you’re trying to access, which can be virtually anywhere. You’ll be watching Friends anywhere in no time! Most VPNs fail to unblock Netflix. Netflix is a tough nut to crack, so it’s no wonder that most VPNs can’t unblock it. As such, you need a VPN that can unblock Netflix anytime you want. ExpressVPN is first on the list, mainly because it advertises itself as having 100% guaranteed Netflix access at $8.32/month for a year. Apart from its unlocking capabilities, it also boasts a massive server count at over 60+ countries, so you’re certain that you can unlock content on almost all regions available around the globe. It also has top-notch security features, a close to perfect customer service and torrenting support! How’s that for a first choice? Get ExpressVPN right now! We do not call NordVPN a “no brainer” VPN for no reason. It’s on par services with ExpressVPN – high internet speeds, top-notch security services and guaranteed Netflix access in lots of servers – make it the best alternative for those who are a little bit short of money. Its $2.99/month deal for 3 years is the best (and one of the cheapest) out there. If you’re looking for a VPN you can use in the long run, try this one. Did you find this guide to be helpful? If you did, start streaming Friends, now! No need to catch up or anything as the series has already ended, but that doesn’t mean you have to be left behind! Remember to unblock Netflix and other streaming sites with a VPN. Subscribe to any of the two we mentioned above!